Do your owners want access to real time information about their properties? Many rental property owners rely on the monthly rent to make their mortgage payment and it's important for them to know exactly what to expect. With a simple click you can give your owners access to Rentables Owner Portal where they can view their property statements and get up-to-date charges and income. Sure, Rentables makes it easy to email owner statements but what happens when they can't find last month's statement. They call you. With a portal account they can easily download any of their previous statements. It's tax time and your owners need all their income and expense data. Or maybe they want to compare last year to this year. No problem. They can conveniently download all their year-end statements from the Owner's Portal. Do you hold maintenance reserves for your owners? With their portal accounts, owners can view their reserves balance at any time. Transparency gives your owners confidence that their properties and money are in good hands. The last thing an owner wants is to find out on the 10th is that their proceeds are going to short because of some unexpected repair. The good news is they can easily see any outstanding charges that are going to be deducted from their proceeds. With a Rentables Portal account, owners can log in and get the information they need without calling your office. This saves you time and keeps your owners happy. Ensuring a good relationship with tenants can increase owner satisfaction with your services. 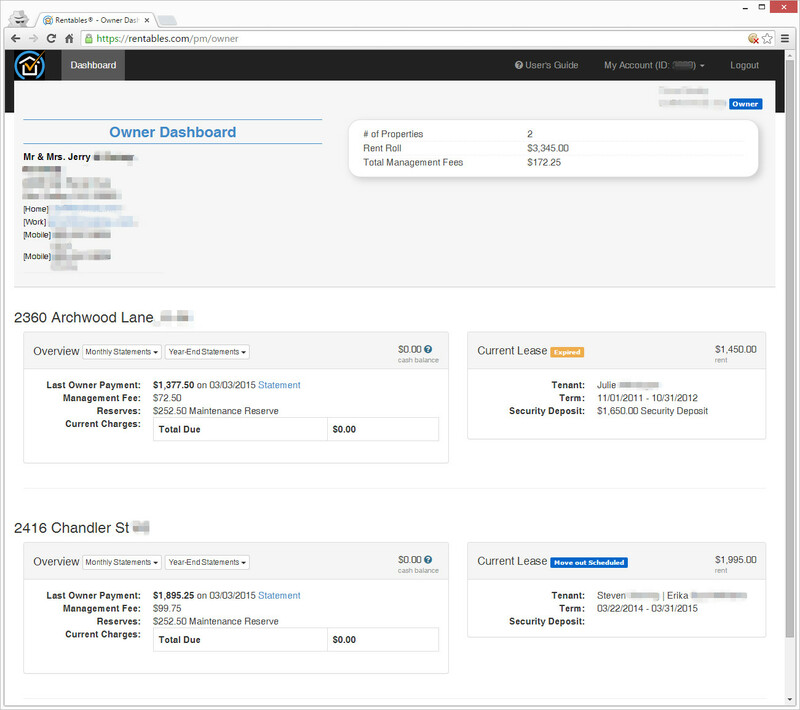 Now you can easily share information regarding leases and outstanding charges with tenants. By giving your tenants access to Rentables Tenants Portal you can help make them aware of upcoming charges, ultimately resulting in timely payments so you can get the money to your owners quicker. No one wants to be surprised by an unexpected charge. By being able to view upcoming charges you can help the tenant plan for these charges. Staying on top of paying charges will get you the money quicker allowing you to forward the money along to vendors, owners, or yourself sooner. Reduce the number of phone calls to your office by letting the tenant view the status of the lease online. Tenants can view the rent amount, terms, and security deposits associated with their lease. Reduce your data entry and never misplace a check again by using Rentables’ ACH to allow tenants to pay rent and other outstanding charges online. Tenants can conveniently and securely log into their account and pay charges. When doing so, the funds will be deposited directly into your account, the charges in Rentables will automatically be recorded as paid, and all the associated ledger entries will be made for you.